Clear out the cobwebs and dust off the barbecue, because patio season is just around the corner. 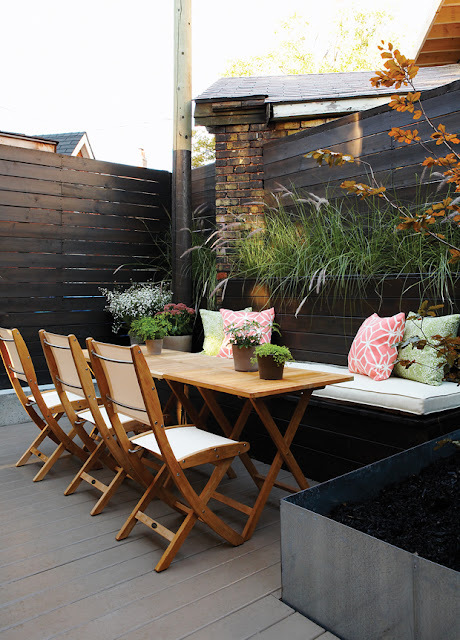 From natural designs that embrace the beauty of nature, to sleek spaces that offer luxury with minimal maintenance — here are 20 beautiful patios with inspiring outdoor decorating ideas to help you create a dreamy open-air retreat. Honey-colored tiki umbrellas contrast white lawn chairs on this neutral patio. A low wraparound bench makes entertaining groups easy, but doesn’t obstruct from this charming Lake Simcoe cottage’s lush view. Layer to add visual interest. 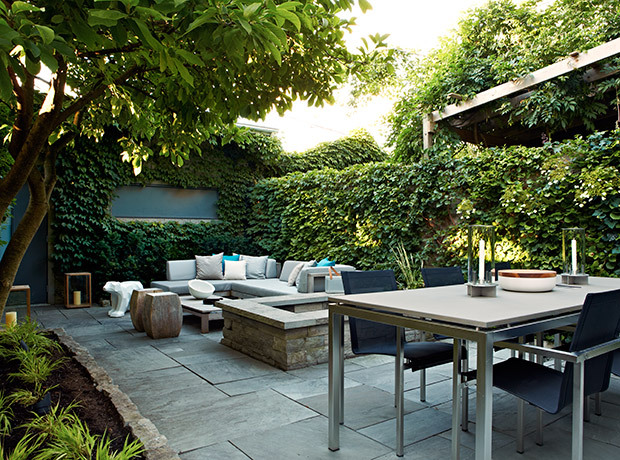 In this manicured backyard, stone and greenery introduce texture to the sophisticated space. The low-maintenance, high-style patio is complemented with modern furniture that makes it prime for entertaining. The dining and lounging areas are separated by a koi pond. 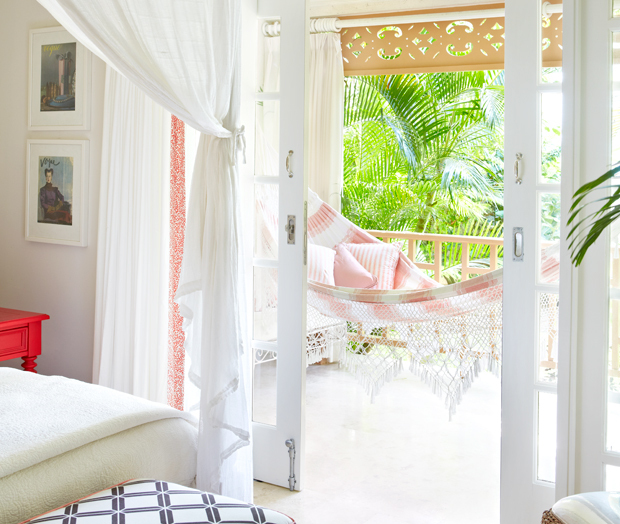 At Colette Van Den Thillart’s Barbados beach house, a private balcony off the principal bedroom is made for relaxation. Coral accents pick up on the interior’s color palette, while the breezy hammock is the perfect spot to enjoy a nap, or a lazy afternoon taking in the lush views. 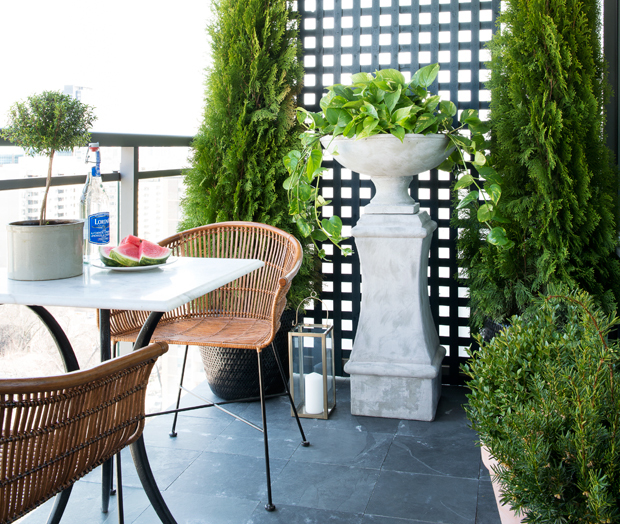 Design editor Joel Bray gave his drab condo balcony a serious upgrade by adding classic elements like painted latticework and a tall pedestal urn. 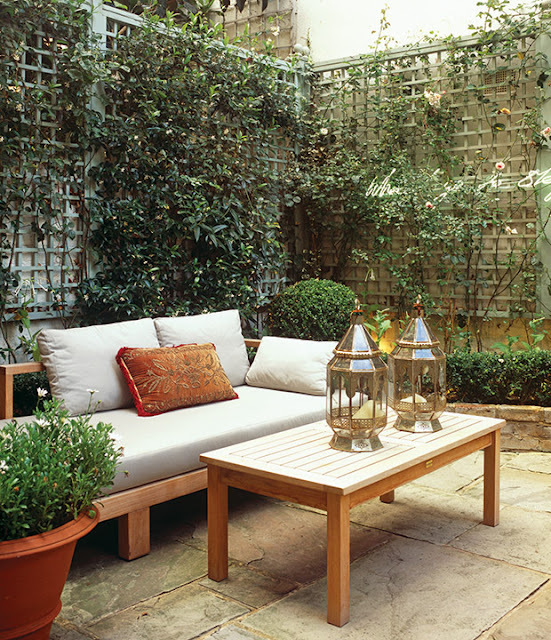 Potted cedars, boxwood and dense yew give the space a lush, garden feel. Joel even “refinished” the floor by laying a thin sheet of cement board on the existing concrete and gluing on 12″ x 12″ Montauk Black slate tiles. Sometimes, less is more. 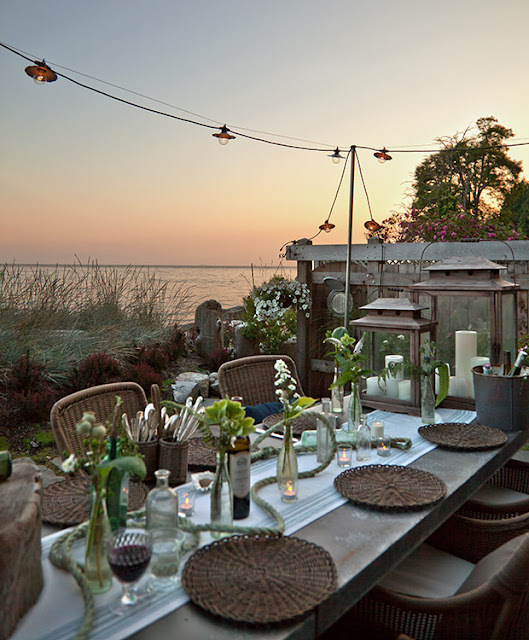 In Lara Irwin’s relaxed seaside patio, a simple brown color palette ensures that nothing distracts from the view. String lighting and nautical accents keep the mood friendly and informal, while a zinc-topped table adds weathered texture. Pair pieces with different styles for a setting that looks inviting and charming as opposed to straight-from-the-showroom-floor. Here, a vintage teak bench, authentic Parisian park chairs and an antique Quebec farmhouse table add old world style and French country comfort. 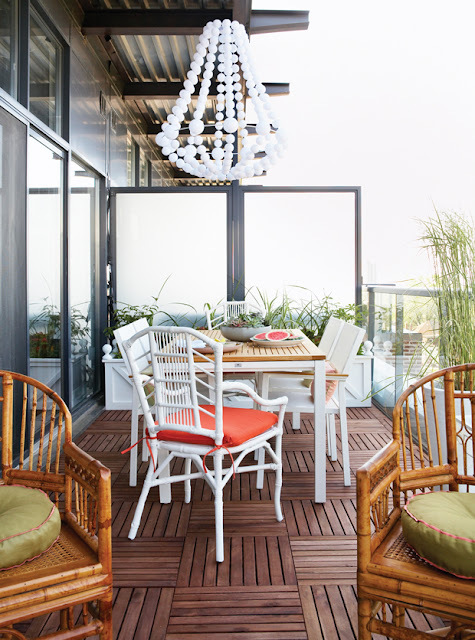 This balcony feels much bigger than its 100-square-feet, despite the surprising choice to go with an all-weather sectional instead of a bistro set. 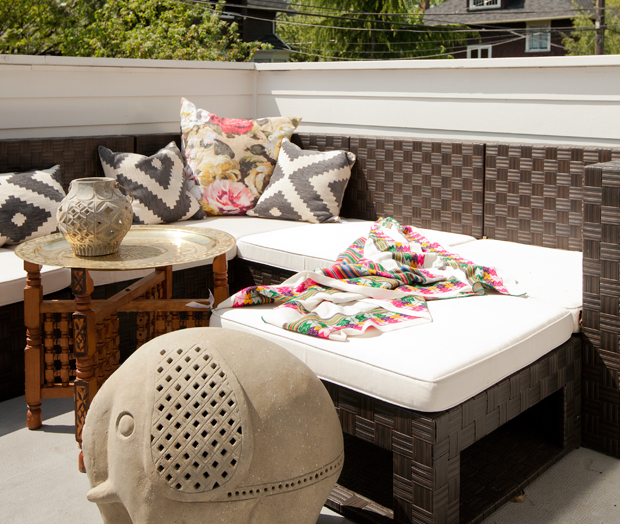 Sailcloth-upholstered cushions add a fun hit of pattern, while a brass-topped coffee table, bright throw and elephant sculpture give the small space an exotic vibe. In the screened-in porch of this expansive Muskoka cottage, a comfortable outdoor daybed and cozy armchairs are covered in crisp white Sunbrella fabric, so it’s both pretty and hard-wearing. Huge windows maximize views to the lake outside, while the white floor and ceiling feels fresh and light. The homeowner, designer Heidi Smith, was inspired by Cape Cod beach houses. 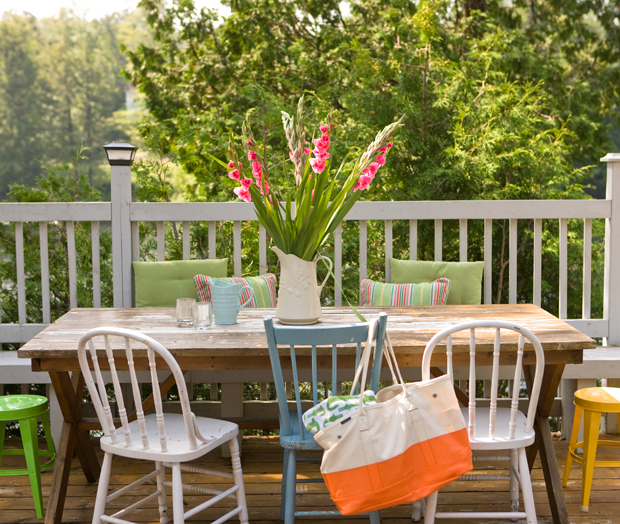 On the upper level of her two-tiered outdoor space, she paired a cedar trestle table with vintage chairs and bright stools for a relaxed, casual look. Sweet cushions in summery hues add to the rustic feel. 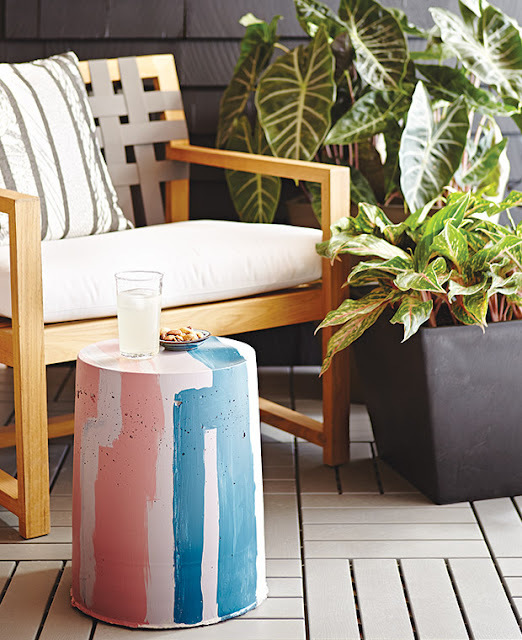 Designer Sarah Hartill made this concrete stool, which adds artistic flair to an otherwise neutral patio. The brushstrokes and soft colors stand out against the spaces’s natural tones. Arren Williams’ patio features freestanding cedar plank walls that draw the eye toward the luxurious dining area. 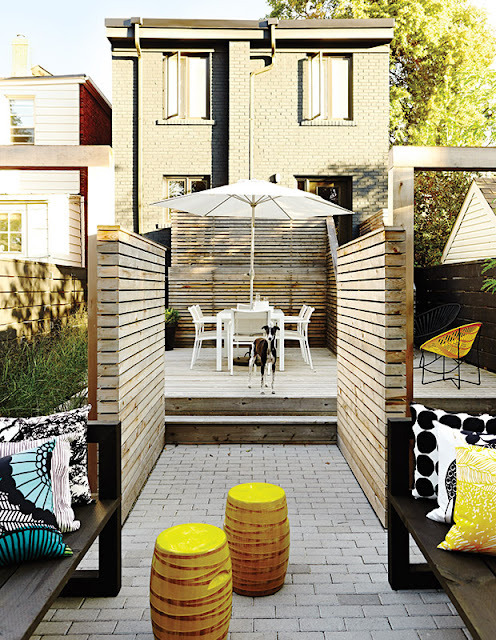 Open sight lines and an oversized umbrella make for a great entertaining space despite the lack of square-footage. Sunny yellow accents are found throughout the yard, while ornamental switchgrass add movement. 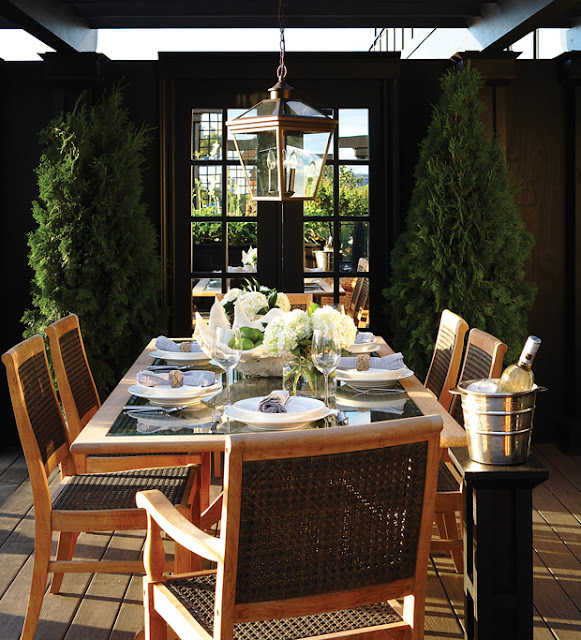 TV hosts Steven Sabados and Chris Hyndman initially wanted black wrought-iron dining furniture for their rooftop terrace, but happened upon a teak set with caned chairs and a glass-topped table. “The teak is just starting to fade into a gorgeous grey that matches the flooring,” says Steven. Rooftops are windy, so hardy trees that do well in containers — such as the evergreens placed on either side of the mirrored armoire — are a good pick. Designer: Steven Sabados & Chris Hyndman; landscape architect, Meredyth Hilton. 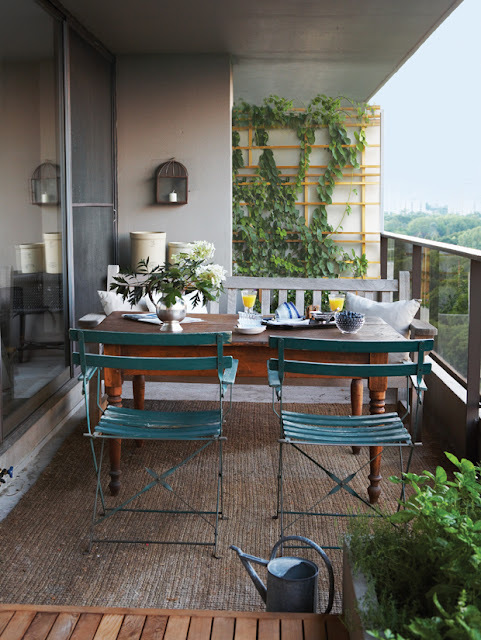 A deck and built-in banquette provide plenty of stylish entertaining space. The classic color scheme of grey-browns and white can be easily updated with new throw pillows. Laying acacia wood, cut-to-fit floor tiles in a cross-hatched pattern overtop the existing concrete floor instantly warmed up this balcony. A traditionally shaped chandelier rendered in white plastic balls keeps the overall look fun. 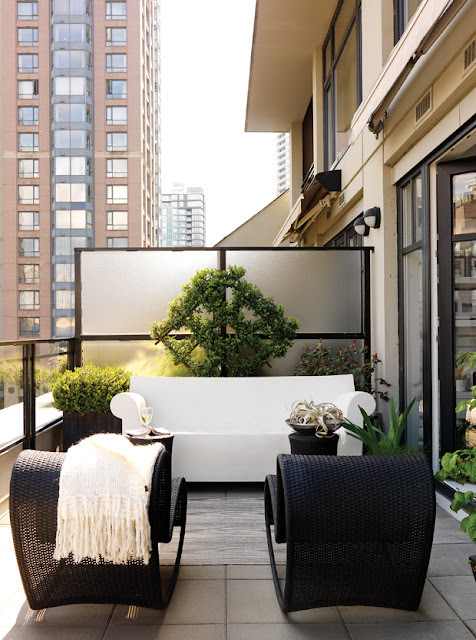 With the help of H&H style editor Michael Penney, executive editor Beth Hitchcock added casual homey charm to her former concrete condo balcony. 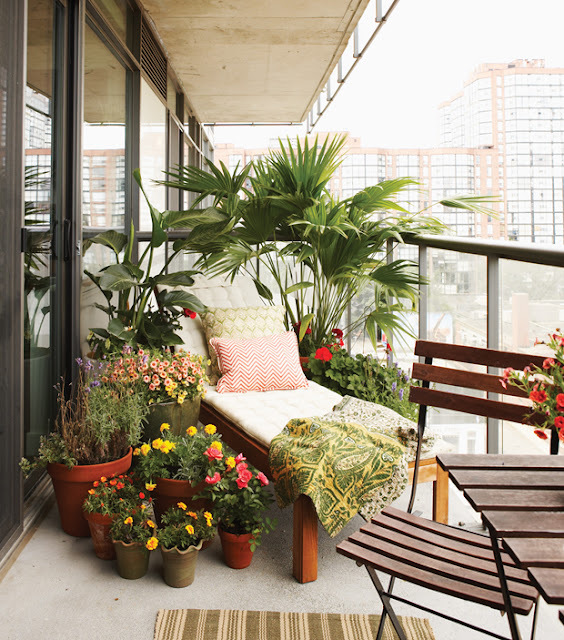 Plants in various colors and shapes create height, dimension and character. A trellis acts as a focal point above this Philippe Starck Bubble Club sofa the same way a mirror or piece of art would above an indoor couch. When we think of gardens, we think of lush, natural spaces, but don’t be afraid to embrace synthetic elements. 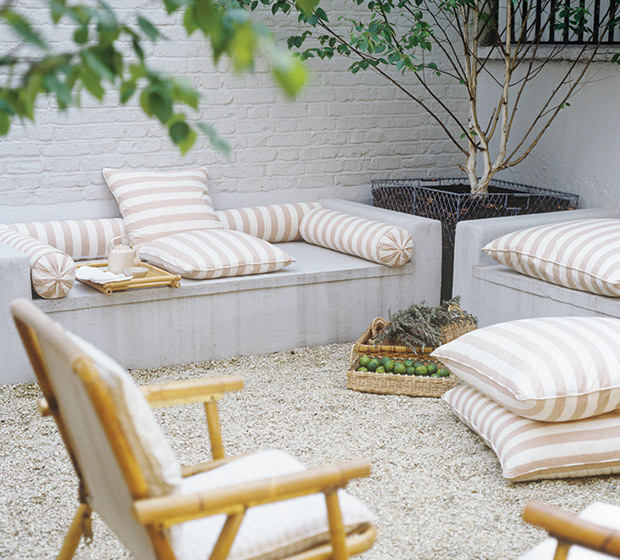 This secluded industrial patio is made cozy with piles of white and cream pillows. Concrete benches double up as seating and a place to serve meals, while greenery pops against the neutral palette. Pea gravel keeps the space low-maintenance. 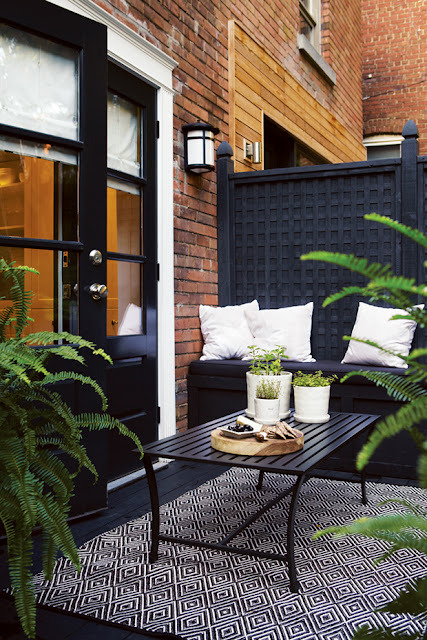 Moroccan-style accent pieces add a dash of the exotic to this shady backyard oasis, while a casual low-slung sofa makes for easy lounging and amplifies the height of the courtyard’s leafy trellised walls. Anne Cote embraced this century-old French country home at the foot of Mont Orford, Quebec, for its charming natural garden. 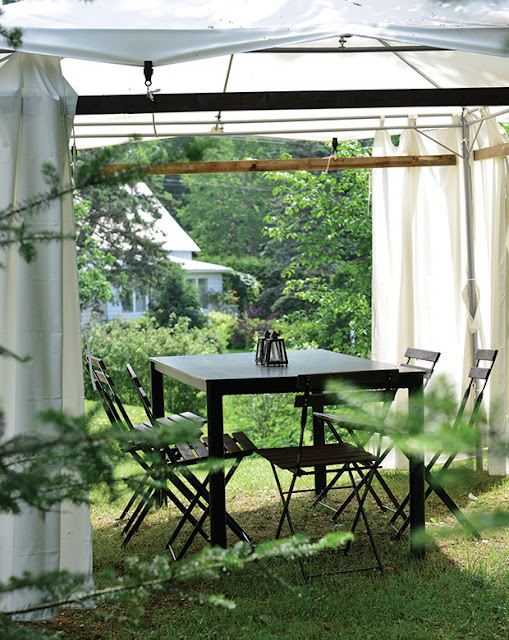 Nestled among an abundance of greenery, an airy white tent provides seclusion for dining al fresco.